To shorten the immensely long waiting time for FFXIII, I decided to have a go at recreating Aerith from FFVII / Advent children. For the other geeks out there, she’s based on the Advent Children version. She’s uploaded to the exchange, go grab her if you wish! HERE she is! Thank you! She’s at least as close as I could get her without using custom sliders! Wow you are a great designer, i bought everything you have except “raine Williams” she scares me a little….. but you are a great designer if you want to know more about me my SIMSLOVERS1214. thank you for being a great designer. we will be expecting a visit from you soon. 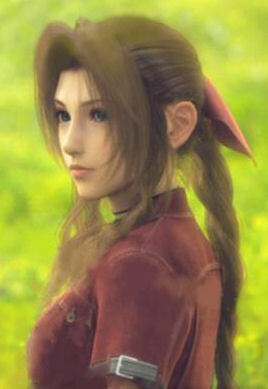 Wow ive been trying to find a decent aeris gainsborough for ages and on here she looks excellent just when i go to put her into my game for some reason she does appear like the picture!